Yesterday morning news broke that TJ Dillashaw popped by United States Anti-Doping Agency (USADA) and New York State Athletic Commission (NSAC), after an ‘adverse finding’ in his one of the most recent in a competition drug test. As a result, TJ surrendered his UFC bantamweight title. Commission punished him for one year of suspension and docking him $10,000 for the violation. Dillashaw’s formal rival Cody Garbrandt and Henry Cejudo also speak out on his drug test controversy. 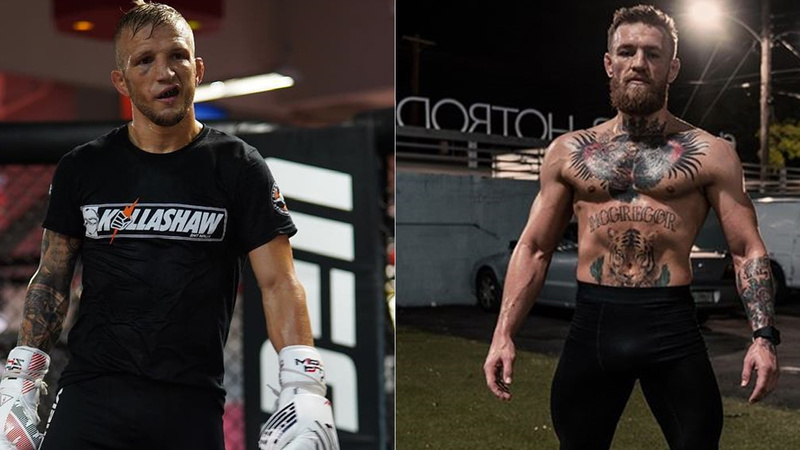 ‘No Love’ previously accused Dillashaw of using a PEDs before their fight at UFC 217 back in 2017. Cody said TJ is on everything and he showed everyone on Team Alpha how to use it. However, Dillashaw did cause a massive rift in his former training camp Team Alpha Male and left to Colorado to join Elevation Fight Team. Cody Garbrandt also said Dillashaw was ‘Cancer’ to our camp, but he suffered two straight losses from the hands of TJ. Mcgregor, meanwhile, is on a business trip to promote his Proper No. 12 Irish Whiskey. Two weeks ago he was arrested on two felony charges for stomping on fan’s cell phone outside Miami beach hotel, and later he was bailed out after paying $12,500. Currently, he’s in negotiation with the UFC for a summer return.